Atmel Solar Panel Battery Charger - Batwatch is a simple monitor for a solar panel battery charger, using an Atmel ATtiny13V. It periodically measures the charge current and battery voltage, and shows them by blinking two LEDs. I built this circuit into the plug of a VW solar charger panel that is used to prevent a discharge of the battery when a car is not used for some time. A modern car contains a large amount of electronics, and a quiescent current of 40-50mA (about 1Ah per day!) is considered "normal". Automatic Trickle Charger - Scroll down to find this circuit. 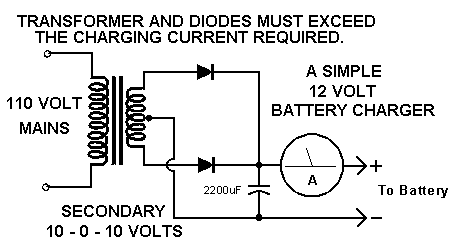 Here is the schematic for the automatic charger I have been using for my kids' battery cars. The charger is a small molded unit that probably doesn't supply more than an amp and this circuit would have trouble with much more. No current limit is provided by this circuit __ Contact: Charles Wenzel of Wenzel Associates, Inc.